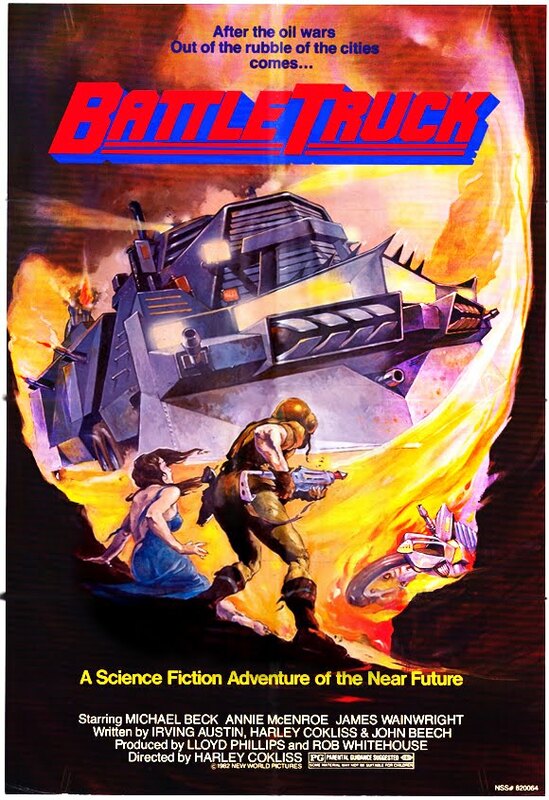 BATTLETRUCK: Living In The Shadow Of The Road Warrior – Schlockmania! 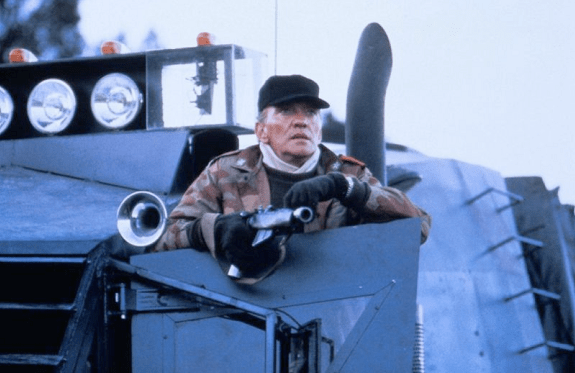 Battletruck, known to many U.S. viewers as Warlords Of The 21st Century, is often lumped in with the glut of post-apocalyptic car movies that followed in the wake of The Road Warrior. However, this simply isn’t true. Both films were produced at the same time and neither was aware of the other so Battletruck can’t be accused of plagiarism. The storylines of both films have some interesting parallels – but it could also be argued that both films owe a heavy debt to the plotting of classic Westerns and samurai films. Battletruck immediately sets up its gritty vision of the futrue by presenting a gang of marauders led by evil Colonel Straker (James Wainright). These fascistic brutes make their living by murdering and pillaging their way across the wastelands aiming their sights upon a peaceful, democratized commune. 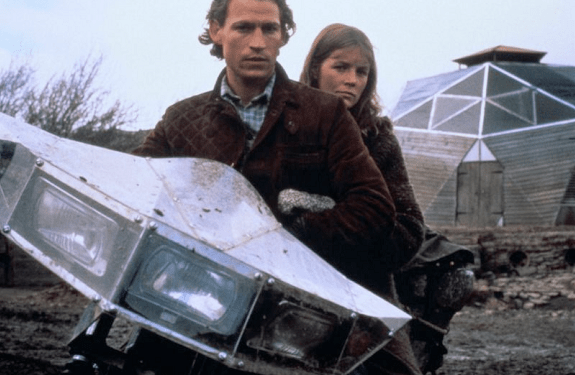 The only person who stands between the commune and certain doom is Hunter (Michael Beck), a tough-guy loner who doesn’t want to be part of a community yet finds his dormant humanity awakened when the little town is threatened. The end result spices up what would become the post-apocalyptic road movie formula with a few clever angles. 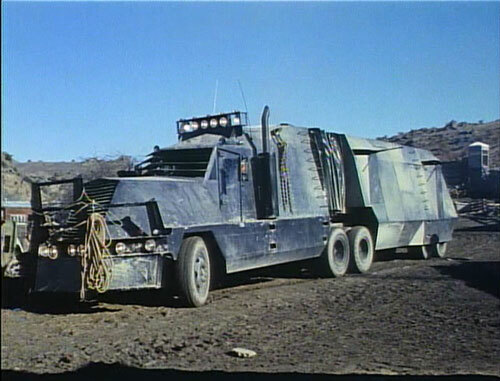 For instance, the titular truck doesn’t belong to the hero: instead, it is the fearsome tool of Colonel Straker. There is also a major female character, Corlie (Annie McEnroe), who has unspoken ties to Straker’s band of rogues but yearns to be part of the peaceful commune. Though she is a typical ‘damsel in distress’ in key ways, she does act as a catylyst for the film’s major plot points. Unfortunately, Battletruck is less than the sum of its parts. Harley Cokliss’s direction is competent and benefits from solid technical credits, namely the skillful cinematography by future Oscar winner Chris Menges, but he lacks the kinetic flair that could have given this material the tension and excitement it needs. Characterizations and plotting are predictable, never adding anything new or noteworthy to the archetypes they follow. In terms of performances, Wainwright creates a nicely understated villain but Beck has little to work with and McEnroe gives a drab, often amateurish performance (an early scene where her character has emotional breakdown is embarrassing). Finally, the film never really takes advantage of its potential for excitement: outside of the impressive stunt-driven finale, the action is rather humdrum in style and delivery. Thus, Battletruck comes off as little more than a programmer, especially when it is compared to the energy and inventiveness of The Road Warrior. It’s a reasonable little time-killer, particularly in light of the truly dire material this subgenre would later produce, but it’s also unlikely to inspire a lot of repeat viewings.